Early on in my low fat plant-based eating, I decided to follow a rule that I’ve stuck with ever since. If I can’t eat it, I don’t make it. I no longer make traditional lasagne or brownies or cake and ice cream for other people. They are welcome to bring whatever they’d like, but the food on any menu I’ve prepared will only be food I can eat. This rule has not created the problems one might assume. Instead it’s provided me with the creative challenge of how to make low fat whole plant foods inviting to my guests. I recently had a grand opportunity to enjoy that challenge when I offered to host “poetry night” here in Moscow. It was originally called (by some people attending anyway) “chocolate, wine and poetry night” so you get the idea about what the standard fare is. When I started attending a few years or so ago (one of my little Victories Over MS is that I was able to attend at all) I would laugh and say, “I can’t have the chocolate or the wine, but I’m hungry for the poetry.” Since this time I had the pleasure of a young co-host who offered to help me set up and who supplied our guests with some of the usual fare– good wine, goat cheese, chocolate and crackers–I set about the task of coming up with some whole food low fat refreshments that hopefully would entice even the most dedicated lovers of chocolate and cheese to try them. 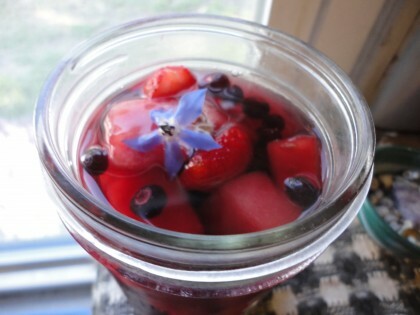 Here is the “menu” of treats I came up with: A big giant blue bowl of my Frozen Fruity Tea. A batch of Holy Shadow Cookies made with mashed banana, dried papaya, fresh cherries and pecans. 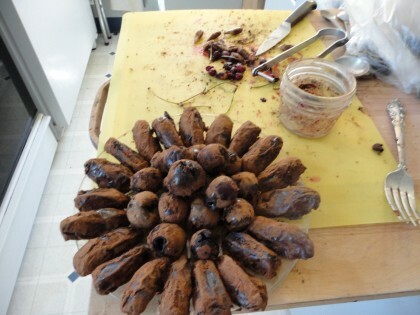 Dusted dates and cherries, in a fresh version of Dusted Frozen Cherries. 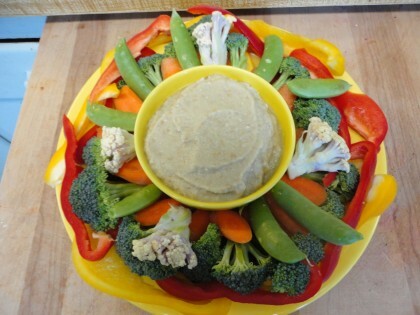 And two veggie plates, one with baba ganoush and the other with a carrot cashew dip. I am absolutely delighted to report that my efforts were successful. People licked their fingers, and asked about the spices on the dates and cherries. Were delighted with the frozen fruity tea, going back for seconds, and, as I suggested, spiking it with wine for a Sangria effect. Were seen standing around the table visiting while waving a sugar snap pea or a strip of red bell pepper in the air before twirling it in some dip. Were heard to say, “You’ve really outdone yourself, this is fabulous.” One friend even took a little of everything with him so he could eat a late night snack when he got home. The “give ’em a little of everything” approach my co-host and I took worked like magic. When on Friday we shopped together for a few things, we laughed to discover that during the week she had collected wine, while I had collected the perfect organic seedless watermelons and raspberries from my garden for the tea. Saturday morning I completed the purchase of veggies at the Farmer’s Market, and my co-host and her boyfriend picked up a fresh baguette on the way over to move furniture out into the yard before our guests arrived Saturday evening. I really love arranging food. I cannot even make a salad without considering colors and textures. So I spent Saturday before my nap “painting” with fruit and vegetables. I didn’t get a shot of the big bowl of frozen fruity tea, but here’s a shot of an individual serving, and two more shots of what came off the “food studio” of my tiny wooden cutting board. An edible flower like this borage blossom, or a pansy or a violet, add an exotic, sweet touch. 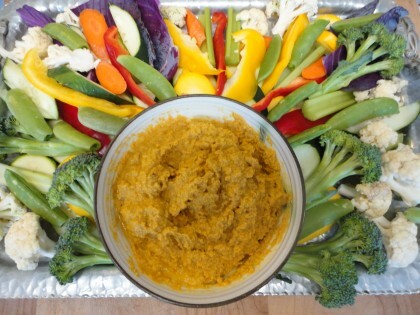 Good choices for veggies to dip with are broccoli, carrots, sugar snap peas, bell pepper strips, zucchini, cucumber slices and cauliflower. Even small red cabbage leaves, if you are adventurous. Taking the pits out of the dates and cherries is a sticky business, but well worth the effort. The other momentus event of that Saturday came when the poetry night friend who had interviewed me on her show at our local community radio station KRFP back in April about my chapbook sent me the link to the archived interview. After my nap I lay on the couch and listened to myself talk about the process of how I came to be able to write the sonnets in what became if a sparrow, and read some of them over the radio waves. She and I had both been nervous about how it would come out, but it came out fine. 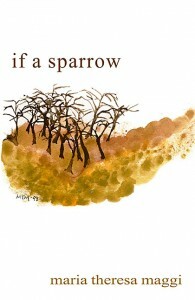 I ended up in tears, the kind we used to watch Miss America cry on TV when she won, because listening to her generous interview and hearing myself respond made my healing and the forthcoming publication of if a sparrow all the more real. My wonderful and gracious poetry night friends came in part to hear me read. They have supported me in this project from the beginning,and many of them, like you, have preorderd my chapbook. I also met two new poetry night attendees who had heard I might read and had come to meet me and listen. It was a wonderful night filled with fresh whole food, good friends, good poems (not only mine—other highlights were poems by Mary Oliver, Tony Hoagland, Wendell Berry, Brenda Hillman, and Billy Collins read aloud, and a recitation by heart from 17th Century Metaphysical poet John Donne). I was overwhelmed in the best kind of way with the feeling that yes, my lifetsyle can support not only my basic health, but my ability to entertain and my deepest loves and callings. So if you’ve got a little while, have a healthy snack and take a listen to my interview. Enjoy a sample of the wonderful poetry from the poets listed above. For a more thorough description of the history of poetry night in Moscow, and how to start your own, you can read this article, written by a poetry night attendee who now lives in Michigan. Find out a little bit about what you’ve gotten yourself into by preordering if a sparrow. And know I couldn’t have done it without each one of you helping to make it real. And I couldn’t feel more happy and grateful than Miss America if I’d actually won the title. I love that you only cook food that you can eat. I love that you shared a virtual poetry night with us. I know your written “voice,” and it was really great to hear the interview and hear your spoken voice! I enjoyed all of the poems that you read on the interview, and especially liked the one about oatmeal, and the one about Valentine’s Day. We will be doing this tonight. My daughters are on board for “just a few” poems, so I am going to make them as special as possible. Fun! I enjoyed hearing that, even when speaking, you are thoughtful and deliberate with your choice of words. It was nice to hear you! This sounds wonderful and I’m sad I couldn’t make it. Next time. 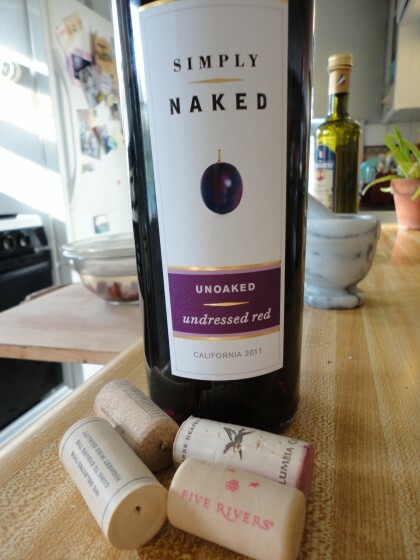 Is Simply Naked vegan and gluten-free? Ohhhh, thank you dearest Maria, for taking your readers into a delightful, delicious in every way poetry night event! WOW…it sounds ~absolutely magical! Only wish Moscow werent soooo far away. I admire as well, your decision to only prepare,- what you can enjoy. No better way to introduce friends to what they may not understand or think they can do. You’re teaching the world how to do this gig beautiful lady…one day, one person, one recipe, at a time!